A small behind the scene look. 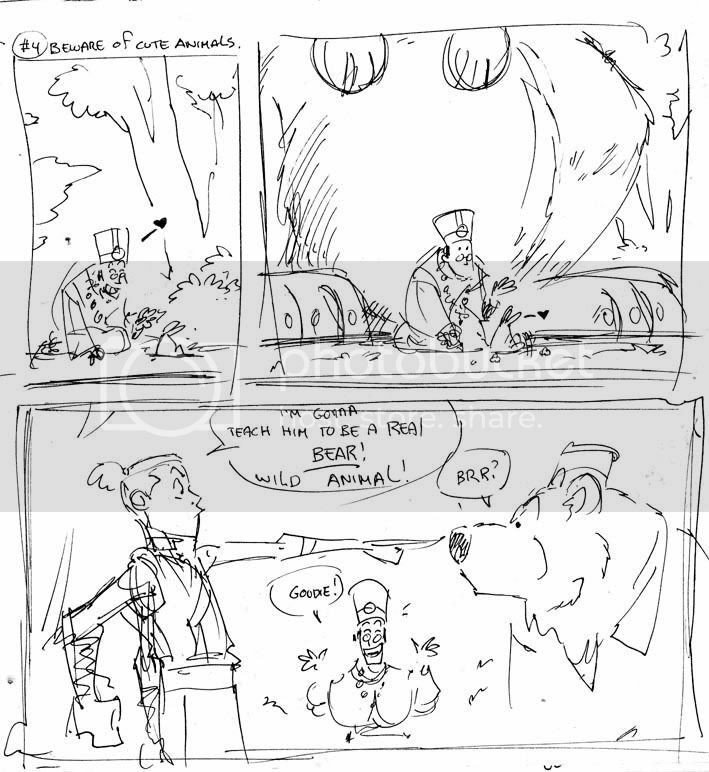 Dug out of my sketchbooks a few thumbnails done for the comic Avatar Special from Nick Magazine. I first pitched the idea of doing something with Bosco, the Earth King and Sokka. At first, Toph was going to play a bigger role, but she kinda fell to the wayside (sorry Toph!). We'd sit with the other writers, and everyone threw ideas around. I sketched some of them during those meetings. Some stayed, others were put in the trash. Josh would then make sense of our crazy rambling and do an actual script. I'd sometime make suggestions, add or delete stuff (sorry Josh!). 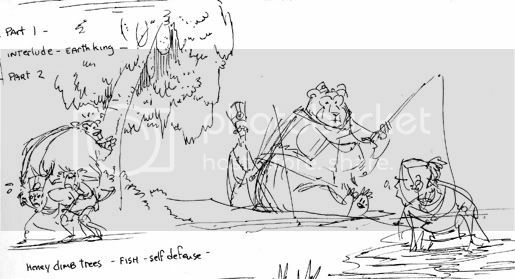 He was very much in charge of polishing the dialogue, which explains why the word bubbles in my sketches were mostly blank this time. Actual size of this page sketch: 3,25" high. And that's all from me for now. More Water Tribe soon, got five pages in the works. He is adorably naive, that's for sure. I'm really looking forward to this magazine! I missed out on the first one, but I noticed Dave had info in his DA account for how to order backissues so I shall be doing that! Posting my little chicken scratches. These are the ones that made most sense. Plus, I didn't want to post about any pages that were not officialy shown anywhere else. Now that you mention it...we've seen very little bunny things in the Avatarverse. Except for the Rabbaroo. Wahaha! ^^ I remember these! I lvoe seeing your sketches again! So quick but so cute! woah! I never heard or saw anything about this giant bunny scene!!! Woot! Love going behind the scenes..your sketches are hilarious! Even without the dialog! Giant bunny ftw! Too bad the giant bunny didn't stay. Oh well, keeping this one in mind for possible re-use. Oooh! These look so different from your WT sketches. The WT sketches are done bigger, with pencils instead of pens, lots of little things to make it different in terms of final look. Aw, but Bosco IS fluffy and cuddly. Even with those claws. Bosco doesn't have much natural instincts left. but he knows many many tricks! Aww, thank you very much *blushes*- hope you and your friend have enjoyed the whole magazine. Everyone worked very hard. Weird that you didn't get a receipt. Hmf! 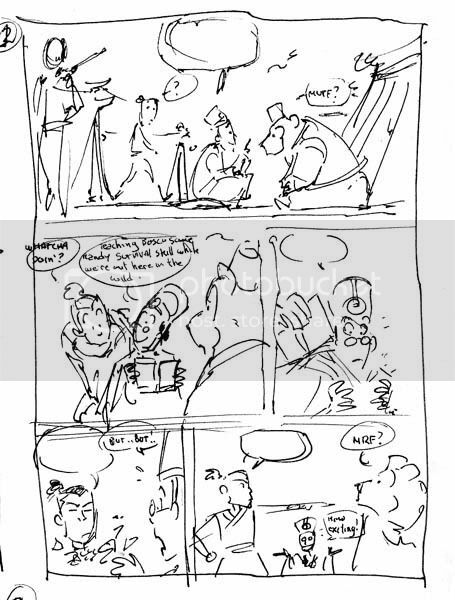 It's really neat to see your rough sketches! Always interesting to see how different people use visual shorthand. Sigh, I still haven't gotten a hold of the magazine, but am hoping to soon. By the way, any idea if there will be more Avatar-centric issues like this? I haven't heard of any news about more Avatar magazines. I do hope there will be more though.